The first ever Joburg City Theatres Schools Setworks Festival will kickstart at Soweto Theatre from 7th to 17th March 2019 and continue to Joburg Theatre from April 25 to 5 May 2019. As part of the festival; Sophiatown will be on stage during this time. 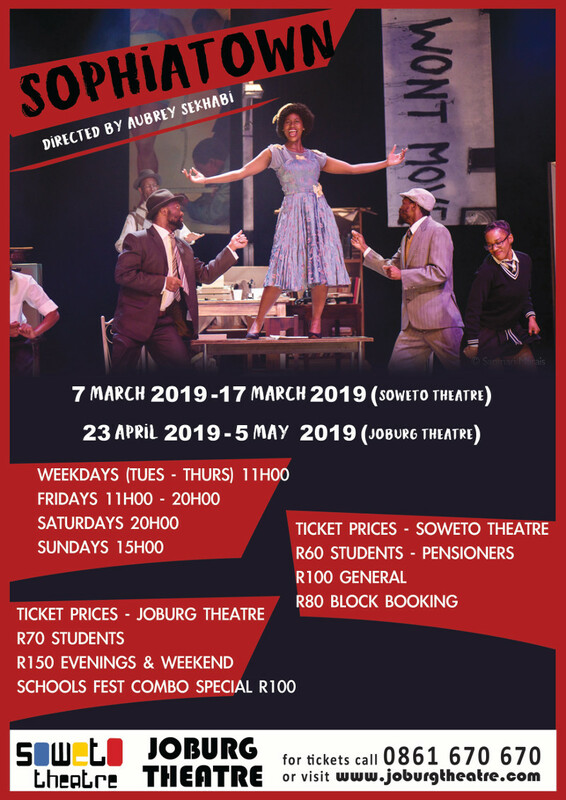 Sophiatown is a lively and memorable musical that will be revived with a fresh and young cast to delight today’s audiences with its timeless music. Under the experienced eye of State Theatre’s multi-award winning Artistic Director, Aubrey Sekhabi, Sophiatown features on stage Phumlani Mdlalose (Jakes), Caitlin Clerk (Ruth), Terrence Ignacious Ngwila (Mingus), Kenneth Mlambo (Fahfee), Barileng Malebye (Princess), Madge Kola (Mamariti), Zama Ngubane (Lulu), and Bongani Masango/ Maurice Matyutyu (Charlie). The story of Sophiatown is an imaginative reconstruction of an extraordinary story of journalists who set up a house together and advertised for an additional housemate to come and live with them. Despite the apartheid legislation of those days, they managed to obtain permission for a white Jewish woman to move in. This character of Ruth Golden (played by Caitlin Clerk) from Yeoville, turns up with a suitcase on the doorstep of an explosive journalist, Jakes (played by Phumlani Mdlalose). The play is interspersed throughout with a’capella harmony and original songs from the period about Sophiatown, or Kofifi as it was fondly known. Despite the violence and poverty, Sophiatown was a legendary black cultural hub and the epicenter of politics, jazz and blues. It symbolised a society that allowed a freedom of action, association and expression; where people lived together in harmony, undivided by race or colour. The very existence of Sophiatown as a ‘mixed’ suburb was in direct contradiction to the apartheid policy of geographically separating people according to their skin colour. Its heydays finally ended when the authorities deliberately tore the area apart. Sophiatown came to be known as the ‘Chicago of South Africa’, and a place where shebeen queens, gangsters, politicians and black and white ‘Bohemians’ rubbed shoulders and traded drinks in a heady atmosphere fizzing with music, style and rebellion. This vibrant community produced some of South Africa’s most famous musicians, artists, writers, journalists and politicians as urban African culture formed here during the repressive 1940s and 1950s. Sekhabi’s directing work is popularly known in famous productions including Kalushi -The Story of Solomon Mahlangu, Rivonia Trial, Silent Voices, Marikana- The Musical, and the new Freedom musical, to name a few. In 2015 his two plays Hungry and Marikana received an unprecedented 18 Naledi Theatre Awards nominations, out of which he won six awards for Marikana – the Musical. For his contribution, his works have been nominated more than sixty times and won numerous awards along the way. General tickets are available for R100 at Soweto Theatre and R80 for block bookings by calling 0861 670 670 or by visiting www.sowetotheatre.com or www.joburgtheatre.com. Joburg Theatre schools festival will include a combo offering to Itsoseng which will run concurrently with Sophiatown. The festival will consist of workshops hosted by thespians and directors, writers, set designers, lighting designer, sound designers and producers, arts journalists and publicists in the theatre spaces. As part of the schools festival, exhibitions will take place at the theatre park across from Joburg Theatre to showcase upcoming set-work season in the year 2020, which includes Things fall Apart by Chinua Achebe, The Island and Sizwe Banzi is Dead by Athol Fugard, Dr John Kani and Winston Ntshona.